Talk about standing on your own feet. 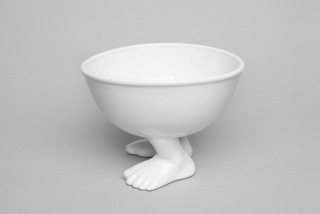 Check out Efeet, Dylan Kendall’s new line of footed home accessories. In today’s world, being normal is over-rated. We all want people to notice how nice our home is or how great cool our dishes are. The Efeet Collection is the perfect conversation starter and takes a stand against the run-of-the-mill boring dishware. Turning the world of traditional dish ware on its head, this collection proves to add that little touch of whimsy everyone longs for. From footed mugs, bowls, mugs and even bathroom sets, these dishes will be a huge hit at any event or gathering. Better yet – like charity and animals? By purchasing a new footed bowl for your pet through www.indiegogo.com you will help animals in need. $1 of each dog bowl pre-sold through the Indiegogo campaign will go to Hope For Paws — a remarkable dog rescue doing critical work in South Central Los Angeles (where I have family) and $1 of each cat bowl pre-sold through the Indiegogo campaign will go to Stray Cat Alliance whose work rescuing homeless cats and advocating for a No Kill Los Angeles is vital to raising awareness and making a difference to the lives of cats on the streets.